The world knows a story of the birth of Jesus but anyone can see it is a total sham by now orchestrated by santa and his evils. There isn't anything in the Bible to support that Jesus was born on 25th and Christ Himself says that He hates it. So this year I am celebrating with a card that is the only link Christ has with 25th December which is Biblically accurate. This is Britain's National Treasure #1, Jacob's Pillar, The Coronation Stone and it is what is known as the Throne of David in Scripture that the kings of the British Isles were coronated upon, dating back to the kings documented in the Bible. On 25th December 1950 the British nation witnessed the beginning of the end of man's misrule forever, after thousands of years, when members of the Scottish Nationalist party took Christ's Throne from Westminster with the help of God, in fulfillment of Bible prophecy, prophesied in Ezekiel 21:27 as the fourth and final overturn, and is now being kept hidden, awaiting the completion, when it is given to Christ our true King. 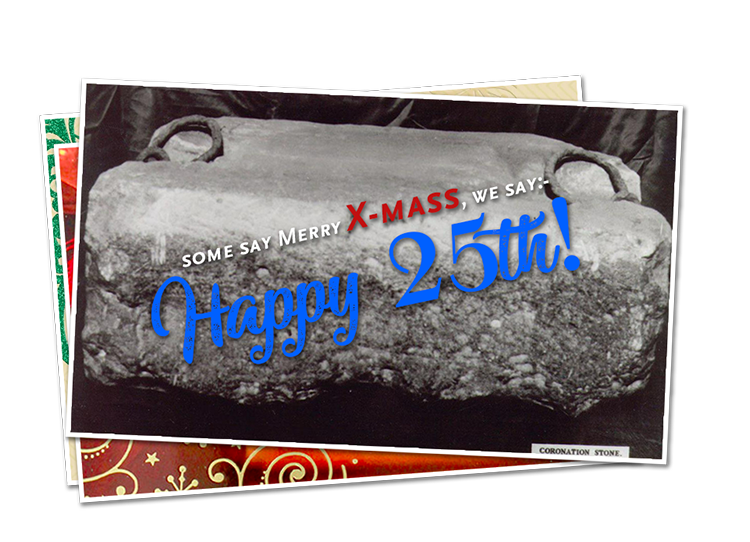 The 25th was the beginning of the end for man's misrule. It still continues and will do so, until the Scots give Him His Throne/Stone, but not for much longer. The King of kings day is almost here. In 1830 a Royal Proclamation was issued by King William IV of the United Kingdom "for the encouragement of Piety and Virtue, and for the preventing and punishing of Vice, Profaneness, and Immorality." Copies of the Proclamation were sent to all the Church of England incumbents, for them to read out in Church. The Proclamation commanded local judges, mayors, sheriffs and magistrates "to be vigilant and strict in the discovery and the eventual prosecution and punishment of all persons who shall be guilty of excessive drinking, blasphemy, profane swearing and cursing, lewdness, profanation of the Lords' day, or other dissolute, immoral or disorderly practices ... and that by their own good and virtuous lives and conversations they do set good examples to all such as are under their authority." For the Encouragement of Piety and Virtue, and for the preventing and punishing of Vice, Profaneness, and Immorality. YOU hear so many strange things about British Israelites. Who are they? where did this Anglo-Israel teaching have its origins? Are they a crazy racist cult, a new American sect? Opponents of Anglo-Israel, having little or no Scriptural evidence to refute our teachings, prefer to frighten sincere seekers for truth by seeking to smear British-Israel with the biggest tar brush possible. A favourite method seems to be that of claiming that the Anglo-Israel teaching originated with the writings of the deranged Richard Brothers, who was for a time confined to a lunatic asylum in the late eighteenth/early nineteenth century. Now I feel sure that you the reader would prefer the truth, and so we will trace the origins of our message and tell you of the many distinguished clergymen, evangelists and preachers of many diverse Protestant denominations who have held to our beliefs, as well as many members of our own British Royal Family. Let us be clear about one thing, there was a knowledge of and writings about the Israel Identity of the Celto-Anglo Saxon and related peoples long before poor Richard Brothers ever stumbled upon this truth. Mike Rivero's comments on "the lost tomb of Jesus"
I watched this show last night, and frankly, I was not impressed. There were three aspects of this program which I found troubling. The first was that the inscription for Mary was using a Latin pronunciation. This was a time when Rome ruled Judea and we are told by the Bible that Mary survived the death of her son. Why would her own tomb be inscribed with her name in the vernacular of the people she would see as the killers of her son? Second, I found it very odd that whereas the still unexcavated tomb was only reachable through a symbolic pipe, the empty tomb that the ossuaries had come from had a concrete-lined access way complete with rebar-rung ladder, As I watched the concrete slab come off revealing the way to the tomb I kept thinking, "How very convenient." Third and most damning was the reliance on the James Ossuary as a reference to confirm the rest of the ossuaries by comparing patinas, and there is the final problem. While I have no problem with the so-called James Ossuary being the missing 10th ossuary from that original tomb, the fact is that the ENTIRE inscription of the James Ossuary has been determined to be a forgery, complete with faked Patina. Hence, if the James inscription is a fake, and the patinas match, then the most likely conclusion is that all the inscriptions are faked. Given that the show described Oded Golan as a collector and failed to mention his being charged as a criminal for numerous such antiquities forgeries destroyed the credibility of this program. Frankly, given his oceanographic works, I am very surprised that James Cameron put his name on this project. - M. R.
Bonnybridge - the UFO visits explained - Cllr. Buchanan vindicated. The UFO's (small, star-like, moving beams of light in the sky) have been visiting tiny Bonnybridge to keep an eye on and protect the Stone of Destiny - the Corner Stone - the Throne of David, guiding me to it, just as the "Star" of Bethlehem guided wise men and shepherds, 2,000 years ago, to the other "Corner Stone - Christ", whose rightful Throne it is. The genuine Stone of Destiny, being at Bonnybridge, can be the only logical explanation of why the UFO's have been visiting Bonnybridge and allowing themselves to be seen, just as the "Star" of Bethlehem was seen 2,000 years ago, for the same reason. The Ruler of the Universe, in fulfilment of His Prophecy in Ezekiel 21:27 and Christ's prophecy in Matthew*, motivated and helped four students, who were Scottish Nationalists, to remove the Stone of Destiny from Westminster Abbey, for Him, on Christmas morning in 1950. The date was a clue to why it was being done. The students tried to do it before Christmas morning, but were prevented by God, because it had to be done on Christmas Day in order to show the true significance of the act. That significance was perfectly understood by George 6th, who knew the prophecy, as did his whole family. That is why the Stone's removal caused him so much distress, as it foretold the end of his dynasty, and that Christ would soon come to claim his Rightful Throne. I will overturn, overturn, overturn, It: and It shall be no more, until He come whose right It is; and I will give It (to) Him. The Coronation Stone that was left on the high altar stone of Arbroath Abbey on 11th April 1951 by Bertie Gray, Ian Hamilton and Bill Craig; taken to London and then returned to Scotland from Westminster Abbey in 1996 with a great deal of pomp and circumstance; which is now so gloriously displayed with pride of place in Edinburgh Castle and upon which Elizabeth Mountbatten/Windsor was crowned in 1953; is absolutely without doubt a fake, and she knew it, which is why she did not want the ceremony televised, but was over-ruled by popular demand. She is terrified that the genuine Stone will be found and Christ recognised as the Rightful King of Scotland and Britain. Satan is having a party tonight - everyone's invited. Tonight, millions of children all over the world will be dressing up in witches hats, monster masks and long black capes. You will probably find that the parents will accompany the younger children. They will be knocking door to door, asking for money, sweets, and earthly luxuries. Elderly people in particular will be terrorised, for one evening only, by these mini masked menaces. "Trick or Treat" will ring around the suburban landscape. Intimidation, scare tactics and pressure will be placed upon the consciences of people all around this evening. Every year it seems to get worse and worse. People being mugged, raped and murdered. The perpetrators are getting older, smarter and more confident at playing Satan's game. All because it's October the 31st. I'm sure the news reports in the morning will tell the tale of how the Devils house party escalated into chaos and confusion. If you're worried/concerned about what might happen. Stay with a friend, be with Father and don't think about what's going on outside. Stay focused. Don't let him in. How old is Grandma? Stay with this -- the answer is at the end. It will blow you away. The Grandma replied, "Well, let me think a minute, I was born before: television, penicillin, polio shots, frozen foods, Xerox, contact lenses, Frisbees and the pill. There was no police radar, credit cards, laser beams or ballpoint pens. Man had not invented pantyhose, air conditioners, dishwashers, clothes dryers, and the clothes were hung out to dry in the fresh air and man hadn't yet walked on the moon. By Professor C. A. L. Totten - Science, Yale. We have received many requests for an outline of the early history of Ireland. In 1905 Professor C. A. L. Totten published "The Story of Ireland" which we have condensed and are republishing that DESTINY readers may have access to this interesting information. – ED. I Timothy 6:20,21 "0 Timothy, keep that which is committed to thy trust, avoiding profane and vain babblings, and Oppositions of science falsely so called: which some professing have erred concerning the faith. Grace be with thee, Amen." 1. I was never taught this truth as a young person, so when I entered college, I was taken in by the evolutionist's claims of the earth being millions of years old. I spent many years in confusion, which is exactly what the devil wanted. There is no need of people being fooled by the false claims of evolutionists. There is no need of you being fooled either. 2. We need to know that all things that called science, is not science. Sometimes it's simply men's opinions. We need to learn that all true science is in agreement with the Bible. The Bible is not a science book, but because the Bible contains all truth, all true science will be in agreement with the Bible. 3. We need to know that the Bible is our guide in this life. In all things, we need to follow the Bible. If there is any question, the Bible has the answer; even in the area of Science. God has not left out what he wants us to believe concerning the creation of this world. He has given us everything we need for time and eternity; therefore, we know he has also given us all the facts we need about the creation of this world.